The short-term outlook at Japan Airlines is partially dampened by JAL receiving only five international slots at Tokyo Haneda to rival All Nippon Airways' much larger gain of 11. JAL had been banking on international flights at Haneda, which are more convenient than those out of Narita, to supply medium-term growth. However, long-haul growth opportunities remain, and JAL can likely still meet its medium-term targets as it pursues expansion of Narita. The focus on the Haneda slot dispersal was Europe and regional Asian destinations. Only one North American slot was awarded (to ANA for a Canadian service), meaning there is little tipping of the scales between ANA and JAL in their main long-haul market. JAL has allocated four of its five Haneda slots; the fifth, to China, remains subject to slot negotiations. All four of JAL's new Haneda services come at the expense of existing flights at Narita. This however was a similar outcome as at ANA, which also used Haneda slots largely to replace existing Narita services. While the Haneda slots are important, they have failed to live up to the hype ANA and JAL placed on them, at least in generating new route options. In the lead up to Japan's regulator the MLIT dispensing the slots, JAL argued for an even distribution; ANA lobbied to receive more slots than JAL in order to help ANA level the playing field (as it sees it) after JAL received government assistance during its bankruptcy restructure. While ANA did receive more slots as it requested, the exact methodology for distributing the slots was not stated, much to JAL's chagrin. Japan's regulatory transparency is only slowly catching up with world standards. Realistically, a better outcome for JAL would have been about three additional slots, a combination of long-haul and regional Asian pairs. Of the long-haul slots, ANA and JAL each received one to France and UK. But ANA received the sole slot to Canada as well as both slots to Germany. Of the regional slots, ANA and JAL each received one to China, Singapore and Thailand. ANA also received the sole slot to three regional countries: Indonesia, Philippines and Vietnam. A split slot dispersal would not necessarily have been balanced due to the differences in short-haul and long-haul sectors, but nonetheless JAL still could have hoped for only a few additional slots. During the allocation process, ANA and JAL generated considerable excitement about the Haneda slots permitting growth. At JAL, much of its medium term management plan banked on international expansion from Haneda, although this was stated vaguely. But far from the promise of numerous new services from Haneda, ANA used five of its 11 slots to transfer services from Narita to Haneda (five were for growth while the 11th slot, for China, remains to be allocated). The proportion of transferred Narita flights is much higher at JAL. JAL has announced plans for four of its five slots. The fifth, like at ANA, is to China and remains to be allocated once China and Japan can facilitate slots at China's slot-restricted main airports. All four of the slots JAL has announced plans for will be used for replacement services, either shifting Narita flights to Haneda or moving night-time Haneda flights to the daytime. The new Haneda slots are for daytime departures and arrivals whereas a previous international Haneda slot allocation was for flights arriving and departing during midnight hours. However, to be fair, ANA was awarded slots to all of the destinations JAL was awarded. The four slots JAL has announced plans for are for replacement services, not growth, and ANA has followed a similar path. ANA and JAL will both use Haneda slots to shift Bangkok, London and Singapore services. Where they differ is that ANA will use its French Haneda slot for a new service, whereas JAL will use it to replace an existing service. So by using ANA as a benchmark, JAL's use of Haneda slots is very similar to ANA's on like routes. ANA is using slots to also add services to Germany, Indonesia, the Philippines and Vietnam. ANA received the sole Haneda slot for Vietnamese services, but JAL will also add a Haneda-Vietnam service using night-time slots. This irked ANA, which protested JAL's flight, but ultimately regulators permitted JAL's plan as it was going to use under-utilised night-time slots. ANA will fly Haneda-Hanoi while JAL will fly Haneda-Ho Chi Minh. Vietnam Airlines will also increase its overall Japan-Vietnam capacity. Vietnam is a growing destination for Japan due largely to manufacturing plants, many from Japanese companies. JAL's Haneda-Ho Chi Minh service will complement, not replace, its Narita-Ho Chi Minh service. Services from Haneda in downtown Tokyo are more convenient than far-flung Narita, and Japanese businesses especially value time. JAL will have an overnight service from Tokyo to Ho Chi Minh while ANA will have a daylight flight. On the return from Vietnam to Tokyo, both will depart Vietnam in the afternoon and arrive back in Tokyo in the evening within an hour of each other. JAL's relatively long layover in Ho Chi Minh is typical of some of its flights that are timed for the business traveller in mind. While this reduces aircraft utilisation (an eight hour layover for a six hour flight is a major compromise on maximum utilisation), it does - or certainly should - allow JAL to secure a plush yield premium. Receiving fewer than planned Haneda slots is a dampener on JAL's expansion plans, which call for a 22% increase in international ASKs between FY2011 and FY2016. However, there is room for variance in this figure as it also embraces codeshares. JAL's 18% FY2011-FY2016 growth figure in number of flights is only for its own operations and excludes codeshares. Additional long-haul expansion out of Narita can also contribute growth, and indeed JAL has already announced plans to restore its second daily Tokyo Narita-New York JFK service (however, this comes after American Airlines ended its Tokyo Haneda-New York JFK service). The focus on international services comes as ANA and JAL seek a larger international role as domestic demand softens while long-haul demand (trans-Pacific especially) grows. Notes: 11: includes codeshares. 12: JAL Group flights only. With growth in long-haul operations, it follows that JAL's capital expenditure will increase as it takes delivery of new aircraft, mainly 787s in the medium term, and A350s at the end of the decade. JAL expects capital expenditure in FY2015 and FY2016 to be significantly higher than in previous years. 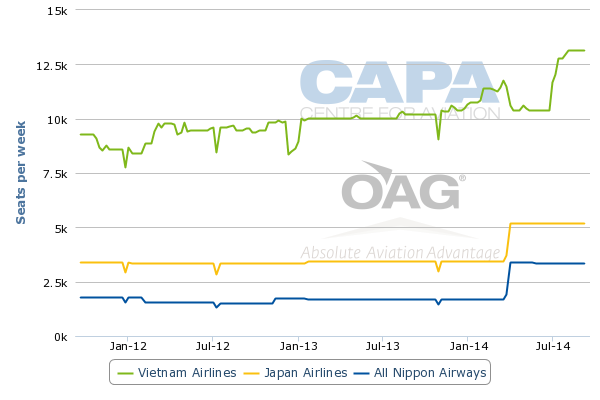 Projected delivery dates, estimated by CAPA's Fleet Database, broadly support JAL's expansion and capex plans. 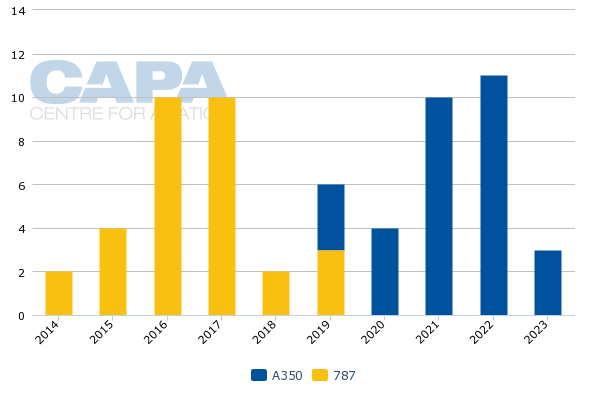 The 787s will be used for growth and replacement while the A350s are more likely to be used as replacements. Aircraft operated by subsidiaries/associates of the main carrier may be listed separately. Firm orders include those placed directly by the operator and by lessors assigned to the operator, from 24-Mar-2014 onwards. A trend at JAL is replacing widebody (777-200/300) aircraft with mid-sized aircraft like the 787s that JAL is taking receving over most of the decade. JAL's fleet plan calls for mid-sized aircraft to replace widebodies. That allows JAL to match capacity with demand and focus more on high-yielding passengers that can offset JAL's cost base, lower than it has been in the past but still high compared to other Asian competitors. In absence of a number of new long-haul services, as ANA has, JAL's notable international expansion developments are with airline partners, although these are mainly incremental additions. JAL in northern summer 2014 will increase codeshare destinations with JetBlue from 60 to 81. JAL and JetBlue started cooperation in Apr-2012 and codeshare out of New York JFK and Boston, both of which JAL serves. JAL will also start partnering with JetBlue out of San Francisco. JetBlue gives JAL another partnership option besides long-time partner American Airlines (the two have a trans-Pacific JV), which has a smaller domestic footprint in Boston and New York than JetBlue. JAL also in Mar-2014 added 12 additional domestic Russian destinations with oneworld partner S7. JAL is increasing Moscow services from three to four weekly. JAL also recently added codeshares with Qantas on Australia-New Zealand routes. JAL in Feb-2014 advised it was considering expanding its international operation at Nagoya in response to the area's economic improvement. JAL said it was studying routes from Nagoya to Southeast Asia, Europe and the west coast of the US. Long-haul routes from Nagoya would break the Tokyo-centricity of JAL and ANA; some suggest that Japan Airlines ought to be called Tokyo Airlines. But any long-haul routes from Nagoya will likely be limited as the focus will remain on Tokyo. But for now the shift will be away from Haneda and back to Narita as Narita prepares for a slot expansion. ANA has flagged it will grow long-haul flights from Narita as part of its objective to have more international than domestic capacity. JAL will undoubtedly follow suit, although it will need to balance feed. Increased long-haul flights out of Narita come as JAL reduces domestic short-haul flights that feed long-haul at Narita, while struggling to be sustainable on their own. But this is only a small component of JAL's business. The core of JAL's business will be its domestic heartland and long-haul flights, especially trans-Pacific where Tokyo offers geography that can make up for JAL's higher cost base. Traffic to and from Japan is the core business but is supplemented by sixth freedom traffic, the options for which are growing as other carriers add capacity across the Pacific. In the face of this, it is logical to grow responsibly with smaller aircraft like the 787 and A350.